You won’t find many people clamoring for a massive overhaul of the NFL’s playoff format, which rightly rewards each conference’s best teams with a first-round bye and home field advantage, but the leaguewide trend toward mediocrity and the imbalance of power among divisions have led to a handful of lackluster pairings over the years, including home games for sub-.500 division winners against red-hot wild card teams. So while college football’s format is far from immune to criticism, SI’s writers and editors dusted it off to create a selection committee of our own, picking the eight most worthy teams for a new, streamlined NFL playoff field. Below is the final bracket—like the current playoff format, the top remaining seed in each round hosts the lowest seed still standing. In the interest of full disclosure, here is the breakdown of how each of our nine NFL experts voted. The complete panel: Ben Baskin, Greg Bedard, Chris Burke, Jacob Feldman, Melissa Jacobs, Jonathan Jones, Bette Marston, Amy Parlapiano and Eric Single. Melissa Jacobs: Baltimore. It’s pretty hard to exclude the Ravens. They’re peaking at the right time (winning four of their last five), just knocked off one of the league’s hottest teams in the Dolphins, boast a dominant defense and are sitting atop the AFC North. They edge out the also peaking Steelers by virtue of beating said Steelers in Week 9. The Ravens have provided some of the most gritty, thrilling postseason games in recent history. But most importantly, we all need as many Steve Smith games as possible. Jacob Feldman: Tampa Bay. Only one other team beat three of our playoff entrants. That was Kansas City, who the Buccaneers topped in Arrowhead. When you add in an OT loss to Oakland, it becomes undeniable that James Winston & Co. have proven their ability to play with the best—and if they were a marquee franchise, they would not have been left out. The Bucs were obviously hurt by their 1–3 start, but they enter December hot for the first time in five years having won four straight. The team’s exclusion will only look sillier after they travel to Dallas on Dec. 18. Greg Bedard: The Steelers or the Ravens, whomever you think is going to win the AFC North. How could we leave them out over the Lions and Falcons? Unless you count the Vikings (you shouldn’t), the Lions haven’t beaten anyone of substance this season. And the Falcons haven’t beaten anyone since the Broncos in Week 5. Meanwhile, the Steelers have beaten the Chiefs and Giants. We way overrated the NFC in this. Eric Single: As long as I’m out on Big Blue Island, I’ll make the case for the Giants’ inclusion. That win over the Cowboys in Week 1 matters to me—even if both teams don’t look the same three months later, beating the best team in the league should be a significant résumé-booster if we’re not going to seed teams by their record anymore. As long as New York’s defense doesn’t succumb to attrition down the stretch (Jason Pierre-Paul, Jonathan Hankins and Damon Harrison all suffered injuries in Week 13), the Giants offer up one of the league’s most balanced teams, if not always the flashiest. Chris Burke: Denver. So long as we’re playing committee here … where are the Broncos’ quality wins? Those victories over Houston, Indianapolis and New Orleans (on the road) are fine, but Tampa Bay is the only team with an above-.500 record that Denver has defeated. The Broncos have lost to the three best teams on their schedule so far: Atlanta, Oakland and Kansas City. Jonathan Jones: Atlanta. I was on the Falcons Train to start the season, and I didn’t expect them to totally implode down the stretch like they did last year. But in this playoff system, how you’ve played lately means a great deal. The Falcons are clearly riding on their 4–1 start, but they have faltered since (3–4). I’d take the Ravens (whose only loss in the past five weeks came at the hands of the Cowboys) and maybe even the Steelers over the Falcons here. Amy Parlapiano: I could make an argument for the Chiefs here—they should be the No. 2 seed—but the Seahawks certainly look to me like they’re one of the best four teams in the NFL. They have one more loss (and one more tie) than the Patriots, but they’ve also beaten them head-to-head this season and have a win over the Falcons on their resume. Based on their schedule and fresh off a 40–7 rout of the Panthers, I’d argue that the Seahawks should jump into the No. 3 slot, while the Patriots move to four and the Raiders to five. Burke: New England vs. Atlanta. Not sure the Falcons could come up with any stops, even against a Rob Gronkowski-less Patriots offense. But the Patriots would have their hands full against Atlanta’s multi-faceted attack, too. This would be a very tricky opener for the No. 2 seed. Jones: Kansas City vs. Seattle. First, I think it’s absurd that the 8.5-win Seahawks with a road victory against the Patriots have to go on the road in the first round. I don’t see Alex Smith converting any third-and-longs against this Seattle D, nor do I see Russell Wilson chucking it downfield after evading a Justin Houston sack and not get intercepted by Marcus Peters or Eric Berry. Pete Carroll vs. Andy Reid would make for a great playoff game, and this one would come down to a defensive or special teams score. Baskin: Dallas vs. Denver fascinates me as a matchup on so many levels. From an X’s and O’s standpoint, you have the league’s best offensive line going up against the league’s best pass rushing unit (36 sacks, tops in the league). Even more interesting to me from a narrative perspective is that you’d have a steely, veteran Broncos team going up against a Cowboys squad led by two rookies in Dak Prescott and Ezekiel Elliott. It’d be the ultimate trial by fire for the two rooks, playing the defending champs in their first playoff game. Actually feels kind of cruel. Feldman: Seattle at Kansas City. The four and five seeds were determined by a tiebreaker—a massively important one given that these two teams feed off the best two home crowds in the league. Can Alex Smith shake a decade-old reputation for coming up short in big spots? Can the Seahawks contain Justin Houston and Dee Ford? Even though a leg injury robbed us of an Earl Thomas vs. Eric Berry face-off for the title of best safety in the league, this matchup still offers boundless drama. Bedard: Cowboys-Patriots, which is what it should be. The Cowboys would sneak by the Broncos in the best first-round matchup because Denver doesn’t stop the run well enough, and then find a way against the Chiefs or Seahawks (I’ll take Seattle). The Patriots would blow out the Falcons, and Oakland is not ready to win in New England. Burke: Dallas and New England. My only hesitation is, if the seeds were to hold, that the Cowboys would have a very difficult matchup against either Kansas or Seattle. Otherwise, this sets up rather well for the top two to survive a couple rounds. Jones: I didn't intend for it to work out this way, but my bracket has what’s essentially the two conference championship games. I think the Pats beat Oakland and the Seahawks win on the road against the Cowboys. Thomas’s injury is major for Seattle, but so is Gronk’s for New England. And don’t look now, but Jimmy Graham is finally rounding into shape for the Seahawks: He’s averaging 65 yards per game in the past five contests, and he’s someone Belichick didn't have to account for in Super Bowl XLIX. Feldman: Dallas navigates an easy path to the Super Bowl, eliminating a flawed Broncos group and then dispatching a Kansas City team recovering from the vaunted “Seahawks hangover”. 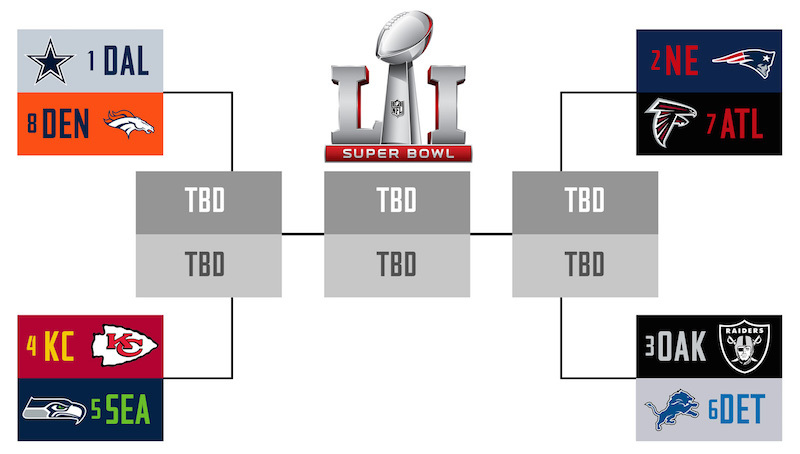 The other side of the bracket is more interesting, with Bill Belichick leading a seemingly undermanned roster against three teams that few had making the playoffs before the season. I’ll put my trust in Belichick to beat out the less-than-complete Falcons and Raiders and give us the matchup we’ve all been hoping for: Cowboys vs. Patriots. Single: I think this ended up being a pretty brutal draw for the Cowboys—few defenses travel better than Denver’s top-five unit, and barring any upsets in the quarterfinals Dallas would have to turn around and beat another excellent defense, no matter who wins that Chiefs-Seahawks game. The Patriots should ride home field advantage to the Super Bowl, where they’ll get a chance to take revenge on Seattle for handing Tom Brady his only loss of the year.